It’s Thursday and I feel the weekend coming. I’ve got to admit, I need the weekend to get here just a little sooner. My night consisted of sleep a little, then lie awake a while as my characters in my current WIP rattle on about what needs to happen in their story, and then a couple of new stories slip in and invade what little time I had left to sleep. Ah, the life of a writer, gotta love it. So, today as I sit in my caffeine filled world, I’m thinking back to one of my favorite works. Safe in the Pirate’s Arms came out of my fascination with pirates. Every time I lost myself in this book, I could feel a sea breeze on my face and smell the salty sea air. The fun thing about getting lost in a story like this one is that for a moment I could be a pirate on a ship sailing the wide blue sea. It was amazing. Every once in a while I get lost in that story for just a moment. Caleb looked down to check the progress of the men when he noticed the boys clothing was wet. Then he did a double take. That wasn’t a boy at all, but a woman. A chill ran down his spine as he realized they had a major problem. Tom saw Caleb’s expression and followed his gaze. He swore when he saw what Caleb did. Caleb motioned for him to take the wheel. He quickly made his way to where the woman stood handing out rope. Luckily the men were so busy that they didn’t notice. He spun her around and their eyes collided. “You need to get to your quarters.” When she just stood there he looked down at her soaked clothing. “Now!” He barked. She looked down and saw the problem. It only took her moments to cover herself and run to her cabin. Caleb was on her heels. The look in his eyes was murderous and she knew it wasn’t going to be good. As she opened the door and turned to shut it, he stopped it with his hand and followed her in. Then he slammed the door, leaving them alone in the small cabin. He made the cabin seem even smaller. “What in the world were thinking? A woman on a ship with a bunch of men is dangerous and foolish.” He ran his fingers through his wet hair in exasperation. “I was desperate.” She said in a small feminine voice. Suddenly she burst into tears and sat down on the little cot. “I didn’t have anywhere else to go.” She started to openly sob. Hope you enjoyed this little tidbit and my adventure into my past work. Categories: Uncategorized | Tags: #amediting #writerslife Author, #amwriting, #throwbackthursday, Historical Romance, Pirate romance, Pirates | Permalink. So, what does this mean, well, it means that if the pirate that’s niggling my writer brain wants to come out, I’ll have to work really hard to squeeze him in. As always, I’ll figure it out. Maybe I’ll finish one of my projects early, then I’ll start a new pirate romance. My fans seem to fall in love with my pirates, so I have exciting news for my pirating loving friends. These two pirates will be coming out in one book soon, really soon and here’s the cover for that book union. Yeah, I’m loving this cover for the series compilation. It’s so gorgeous! So, for my fans that love my two favorite pirates, here’s a special edition. I hope you enjoy your Sunday. Go out and do something fun. Categories: Uncategorized | Tags: #amwriting, Anthology, Authors, Love, Pirate romance, Pirates, Romance, Sea, Writing | Permalink. Have you noticed a trend lately? Of course, as you know, I have no problem with the Cowboy or Pirate heroes, as I write mostly about Cowboys and Pirates. But it’s funny the interest in these types of leading men. But with that being said, why is it so popular in the romance genre? I don’t see a lot of cowboy heroes on movies or pirate heroes for that matter. It’s as though romance readers need that masculine persona that follows a cowboy or pirate. On the side of the cowboy, there’s the fact that they’re usually strong from working the ranch all day. So that’s a plus for a hero. Then, of course, they can ride in on their horse and save the day, or truck, whatever the scene might need. A fictional cowboy is usually honor bound and very protective which lends a good lead male character. Don’t forget that handy Stetson to keep the sun out. Now we can’t leave out the Pirate, good or bad, they make a great male lead character. Of course, they command a ship, which means they are a take charge man. A good pirate can take care of his heroine and lead his ship through the worst storm without batting an eye. Then you have the bad pirate, but you can have them turn good pirate, which usually takes a strong heroine to take care of that task. Don’t forget the attire of a pirate. I always think of ‘Jack Sparrow’ or ‘Will Turner’, yes, I’m a Pirates of the Caribbean fan. There are so many hero types that lead to a good romance. Don’t forget the law officer coming to the rescue, the firefighter saving the lady from the fire or even the country boy that’s not quite a cowboy, but has polite values and that protective gene. So, who makes a good hero for you? Categories: Author, Books, COwboys, Pirate Romance, Pirates, Romance, Uncategorized | Tags: #amwriting, Authors, Cowboys, Heroes, Love, Pirates, Romance, Writers, Writing | Permalink. Good Monday morning. I hope all of you had a great weekend. As for me I start this week with a special piece of news. I’ve joined forces with Southern Writer’s Magazine for a giveaway. 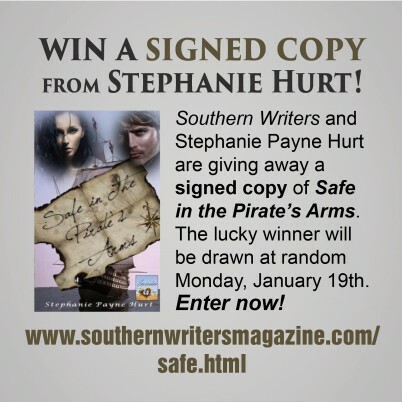 Sign up this week for a chance to win a signed copy of “Safe in the Pirate’s Arms”. It’s been great all the help Southern Writing Magazine has been handing me. Categories: Uncategorized | Tags: Authors, giveaway, Paperback, Pirate romance, Pirates, Signed Books, Southern Writer's Magazine, Stephanie Payne Hurt, Writing | Permalink. Good morning all! It’s Tuesday and it’s cold here in Georgia. As I snuggle under my throw with my coffee at my side and the fire crackling I have to smile. It’s cozy and warm with Christmas cheer in my den. I love this time of year. The Christmas tree is twinkling beside me as though it’s saying Merry Christmas Stephanie! As for presents, are you finished with your shopping? Me, well, almost, but I still have a couple of things to pick up. 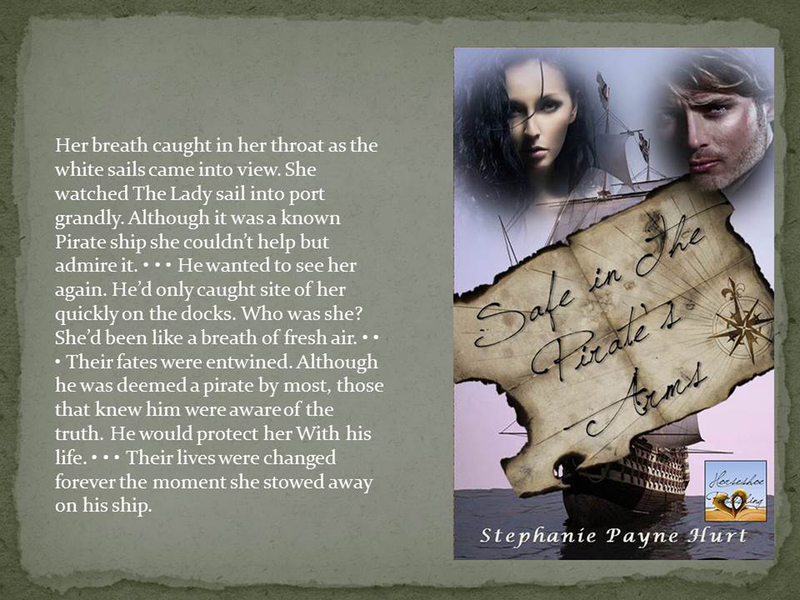 If you need a stocking filler or a gift for a reader, why not check out Safe in the Pirate’s Arms. It’s an adventurous love story with suspense, romance and pirates. Several readers have commented that they felt like they were on board the ship as I described every detail. I want my readers to experience the book, not just read them. Lightning streaked across the clouds just ahead of them. Caleb widened his stance and prepared for the battle with the storm. He’d been through worse. The first drops of rain caused the men to move faster. All of the cargo had to be tied down. Serena helped by handing out coiled rope to the men. She never thought about the rain causing her clothing to cling to her body. He sat there for a moment. It was evident when he’d been at Edwards home that something was wrong. The man seemed crooked. It angered him that the man was part of the pirate’s that he fought against. Standing up quickly he looked down at her. He could only imagine why her mother was worried. That man was pure evil and he was glad she’d gotten away, but a woman on a pirate ship, even though his men were all good men, they were men. Categories: Uncategorized | Tags: Amazon, Authors, Barnes and Noble, Christmas, Ebook, Gift Ideas, gifts, Paperback, Pirate romance, Pirates, Romance, Writing | Permalink. It’s overcast here in Georgia. The temperatures have been amazing the last couple of days. But today starts a seven day trend of ran, storms and just plain out nasty weather. The overcast darkness makes me sleepy and it’s hard to stay awake. My night consisted of fighting with the bed for about two hours, then going to the den to curl up in the corner of the couch to read for about thirty minutes (actually read for 2 hours) and then going back to bed and finally drifting off to sleep. For some reason my sleeper was not working last night. Don’t you just hate those nights when you’re sleepy but once your head hits the pillow it goes away. So how’s your Friday morning going? I hope you’re planning a fantastic weekend. For me I have a wedding to attend tomorrow and you all know how I love weddings. They inspire me as a romance writer. Categories: Uncategorized | Tags: Drowsy, Insomnia, Love, manuscripts, Pirate romance, Pirates, Romance, Sleepy, Weddings, Writing | Permalink. For the last two nights I’ve written until time for bed. Which you might be saying, that’s good, you’re getting in writing time. But there’s a problem. I have a couple of characters that are pulling at my sleep strings. As soon as I put my laptop down and head to bed my mind wonders to them. Monday night I laid down and picked up my Kindle to read a little before bed. Of course my eyes got heavy and not from boredom with my reading selection, it’s really good, but I was tired. So I turned out the light and lay my head on the pillow with a contented sigh. The problem started at that moment of contentment. The characters in my pirate romance were telling me to get up. I quickly tried to push them to the back of my brain. I do run a busy accounting business and sleep is something I need. But they were persistant. I rolled to my other side and tried again, but guess what, they were on that side too. Finally about an hour later and really wound up sheets I got up. You’d think I would pick up my laptop, but I refused to give in to the characters demands. I carried my Kindle to the couch and turned on the lamp beside me. I situated myself comfortably in the corner of the couch and settled in to read until I could go to sleep. The characters kept up at the needling. I knew that if I gave in to them I’d be up the rest of the night writing. Have you ever wondered if your characters haunt you? Well, I’m here to tell you they do. Every time I would get into my book a noise would happen in the room that I couldn’t explain. One time something shifted in the corner and I almost jumped off the couch. I turned toward said corner and frowned. I refused to answer their call. Then it happened again last night, but this time I refused to give in. I tossed and turned. The good thing that came out of last night’s insomnia trip was I rewrote one of the scenes in my head. This morning I changed it and was pleasantly surprised with the results. The chapter flowed so much better with the changes. SO maybe the insomnia was worth it. But of course my tired, blood shot eyes this morning don’t think so. I so need a nap, but I’m not going to tell my characters, hopefully they’re tired from their constant nudging. Categories: Uncategorized | Tags: Character takeover, characters, Insomnia, Pirate romance, Pirates, Writers, Writing | Permalink.